It is understood the man owed a drug debt to members of the Kinahan cartel. GARDAÍ ARRESTED TWO people they believe acted as spotters for the gunman who carried the gangland murder of Noel ‘Duck Egg’ Kirwan. The man and woman, who are both in their 20s, were arrested in north county Dublin early yesterday morning. The man has a criminal record and is known to gardaí for low level drug use and minor assaults. The woman is a close friend of the arrested man. It is believed the pair were paying off a drug debt owed to the Kinahan cartel by acting as spotters. This involves the spotter contacting the cartel when they see the intended target of the shooting. 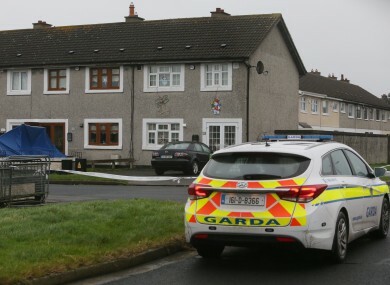 Kirwan was shot dead in the driveway of his house at St Ronan’s Drive, Clondalkin Dublin 22 on 22 December. It is understood he was murdered as part of the Kinahan/Hutch feud due to his close links to Gerry ‘The Monk’ Hutch. The arrested man has a handful of minor convictions. At his last sentence hearing in 2015, the judge had told him that he was giving the man a last opportunity to turn his life around and imposed a fine and suspended sentence. The man had been high on drugs when he assaulted a shop assistant in the north county Dublin area. He had knocked stock out of her hand and had verbally abused her. On another occasion, the arrested man was caught with a small amount of cannabis. The judge at the time was told that his partner had given him “a stern talking to” about using the illegal drug. The man and woman are currently being questioned at Lucan and Blanchardstown garda stations and are being held under Section 50 of the Criminal Justice Act. Email “Gardaí arrest couple for acting as 'spotters' for man who killed Noel Kirwan ”. Feedback on “Gardaí arrest couple for acting as 'spotters' for man who killed Noel Kirwan ”.